Nina Sovich had always yearned for adventures in faraway places; she imagined herself leading the life of a solitary traveler. Yet at the age of thirty-four, she found herself married and contemplating motherhood. Catching her reflection in a window spotted with Paris rain, she no longer saw the fearless woman who spent her youth traveling in Cairo, Lahore, and the West Bank. Unwittingly, she had followed life’s script, and now she needed to cast it out. Inspired by female explorers like Mary Kingsley, who explored Gabon’s jungle in the 1890s, and Karen Blixen, who ran a farm in Kenya during World War I, Sovich packed her bags and hopped on the next plane to Africa in search of adventure. To the Moon and Timbuktu takes listeners on a fast-paced trek through Western Sahara, Mali, Mauritania, and Niger, bringing their textures and ﬂavors into vivid relief. On her travels, Sovich encounters rough-and-tumble Chinese sailors, a Venezuelan doctor working himself to death in Chinguetti, indifferent French pensioners RVing along the coast, and a close-knit circle of Nigerien women who adopt her into their fold, showing her the promise of Africa’s future. 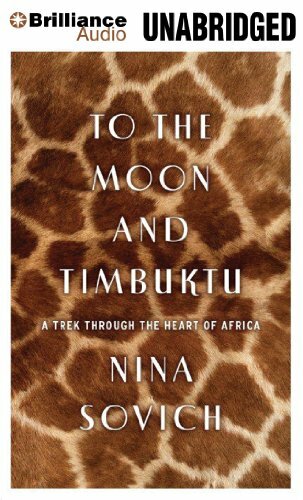 This lyrical memoir will transport you to the breathtaking landscapes of West Africa, whose stark beauty will instill wonder in even the most experienced traveler. Sovich’s journey reveals that sometimes we must pursue that distant glimmer on the horizon in order to find the things we value most.